It’s week seven of M2B marathon training for me and thank goodness lucky number seven is a cutback week! After a 20-miler at 9:35 pace, an 18-miler at 9:20 pace and a 20-miler at 9:20, I look forward to “only” 13 miles at 8:50 this coming weekend. I feel good but tired. Good and tired, that’s for sure. A story to illustrate: After running those 20 miles last weekend, I slept 10 hours that night. When I finally woke in the morning, I realized I could see surprisingly well without my contacts in. *blink* *blink* Wait a minute. My contacts ARE in. That’s right. I’d set aside my book, turned out the light, and gone to sleep with my contacts in. In nearly 30 years of contact lens wearing, I can say that’s never happened before. I’ve fallen asleep by accident with them in, most likely while snuggling a toddler or nursing a baby to sleep, but I have never before deliberately gone to bed and forgotten all about my contact lenses. No harm done thank goodness. On my “recovery” day, I spent three and a half hours in the garden, clearing a 9′ x 4′ patch of ground, turning over the soil, and mixing in compost and fertilizer. 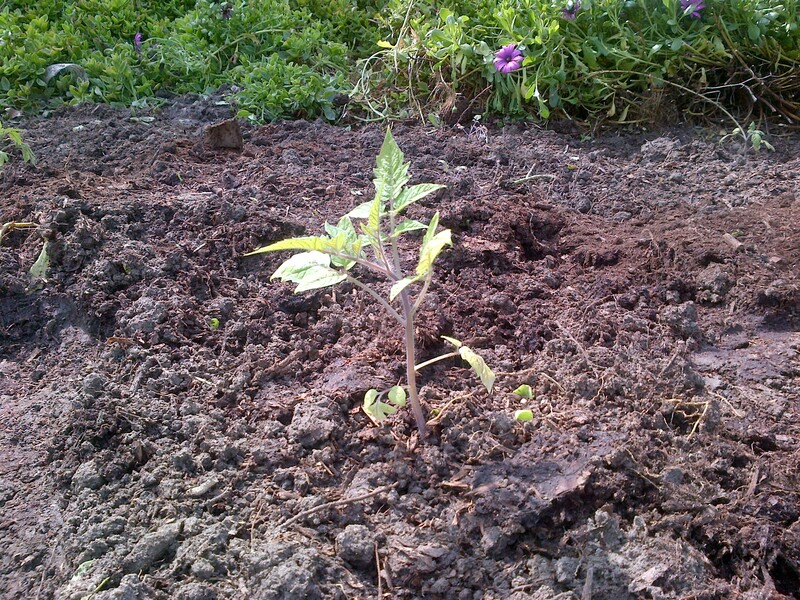 Finally, I planted 18 tomato seedlings. I started the seeds in trays in mid-January, potted them up in mid-February, hardened off the seedlings in early March, and got the seedlings in the ground in mid-March. Hello Roma! I hope we spend a wonderful, productive spring and summer together! That’s two months of hard work I left out there, exposed to the weather and the dangers of bunnies, gophers, snails and slugs. I remember one year I planted seedlings and my toddler followed behind me and dug up some of the plants. Another year I sprinkled bone meal in each of the holes to fertilize before I put in the tomato seedlings. I came out the next morning and the neighbor’s dogs had dug up every single one of my plants! This year, no toddler (my 4.5-year-old knows better than to mess with Mama’s plants) and no bone meal (and no dogs — the neighbor put up some lattice so the dogs can’t climb over the chain link fence). Today I went out and put little “collars” around each of the transplants in a feeble attempt to ward off the snails, slugs, and roly-poly bugs. Do you build in cutback weeks during your training? I wouldn’t survive without them!